Even the arrival of Mr. Grinch couldn’t dampen the Holiday spirit that filled the room at our meeting this past Friday. We were treated to another outstanding production from our resident musical troupe consisting of Ned Consigny, Gary Gilmore and Jim Finn, otherwise known as a ConGilFin Production. They were ably assisted by the booming baritone of Joe Pottebaum as he led the Club through some spirited renditions of holiday classics. And, you know ? – we sounded pretty good! The event was made even more festive with a cameo appearance by the Rotaryettes, “Garynna” Gilmore and “Jimmette” Finn, and their rendition of “Sisters” from the movie White Christmas starring Bing Crosby and Danny Kaye. Of course, now we know what killed Vaudeville. Also joining us for reindeer games was “Rollo” the Red Nose Reindeer, a.k.a. 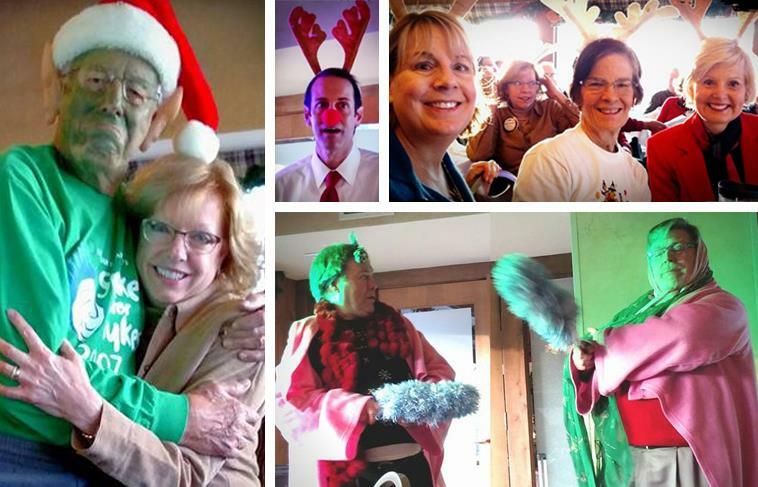 Jim Dunn and his Rein-dear friends – Marie Owens, Jeanne Allen, Chris Spresser, Kathy Becker, Linda Wickstrom, Linda Edelstein, Dana Johnson, and Gwen Condon. It was great fun and a fantastic way to end the year! We’ll be taking the next 2 weeks off as our members spend the holidays with family and friends, and be back for our next meeting on Friday, January 9th. Finally, our thoughts, prayers and best wishes go out to all of our friends and family who cannot be with us during the holidays including those who are serving our country. And in the spirit of Rotary, let’s all remember to share some of our blessings with those who are less fortunate than we are, and carry this holiday spirit into the coming New Year.